More than a catchy buzz phrase or trending hashtag, Philander FORWARD is an ongoing commitment and challenge to strategically and thoughtfully elevate Philander Smith College—positioning it to prosper and thrive within the ever-changing landscape of higher education. Philander FORWARD is a promise that the institution will immerse itself in enriching and worthwhile activities to move it toward the upper echelons of the country's top historically Black colleges and universities. Philander FORWARD is a mindset to guide the College's work, actions and interactions and to spur its constituents — students, faculty, staff, alumni and friends — to consider: “What am I doing to help move Philander Smith College forward?” or “Is this an action that will help propel Philander Smith College forward?” and "What more can I do to help push Philander Smith College forward?" We entreat each of you to join us in this FORWARD movement. There is a vital role for all to play. IN 2015, at the onset of President Smothers' administration, the PSC Community launched a Campus-Wide Dream Initiative to inspire all to think big and imagine boldly for Philander Smith College. This initiative was inspired by a quote from Ellen Johnson Sirleaf who said: “The size of your dreams must always exceed your current capacity to achieve them. If your dreams do not scare you, they are not big enough.” To this end, our Ellen Johnson Sirleaf-inspired dream exercise resulted in five (5) “Forward Initiatives” on which the College has placed immediate focus while working simultaneously and collectively to shape Philander Smith’s new 10-year Long-Range Plan. The goals of this campus-wide Initiative are to address and eradicate the cultural traits that tend to impede progress at Philander Smith College. This Initiative endeavors to promote a culture of high expectations in which all community stakeholders embrace the PSC Timeless Human Values of Self-Respect, Respect for Others, Respect for PSC, Leadership, Scholarship, Spirituality and Service. This Initiative allows PSC to respond to the growing demand for minority health care professionals in strategic fields (nursing, rehabilitation counseling, public health, etc.) The Joycelyn Elders School of Allied and Public Health will also provide an opportunity for PSC to become more engaged in critical research that contributes to the greater body of knowledge needed to eradicate health disparities in communities for people of color. The development of this new school opens the door for Philander Smith to offer more relevant degree programs which are aligned with the economic drivers of the future in Arkansas and beyond. This Initiative positions Philander Smith as a key player in solving the urban issue of underemployment in Arkansas. Already gaining tremendous traction and attention throughout Arkansas, WISE P3 will address the skills gap by providing training and education aligned with corporate and industry needs. Many in the Community dreamed of a day when Philander Smith could revisit its foundational academic programs (ministry/religion, teacher education and music) and “breathe life” back into them. We have embraced this dream; thus, the Teacher Excellence Task Force was born to conceptualize a way that Philander could become a leader in addressing rural and urban educational challenges in Arkansas. The Task Force has been appointed and charged with re-imagining teacher education and positioning the College to produce highly qualified teachers who are equipped with the knowledge, skills, dispositions, and cultural competencies needed to transform toxic school cultures. 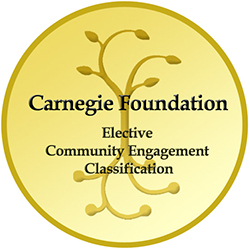 This Initiative was born from stakeholders' dreams of an educational opportunity that would open the doors of access to students on both ends of the academic spectrum--one that would provide developmental and academic enrichment for those students who need it. Most importantly, it would provide them with tools to achieve success. This strategic recruitment initiative was developed to identify a new type of student for Philander Smith College – one who is SERIOUS! Through four creative tracks (Community, Ambassador, Urban, and Christian), S.T.A.R.T. guarantees the participants a STRONG start at Philander Smith College. This FORWARD Initiative involves the reimagining of PSC’s current Social Justice Institute. 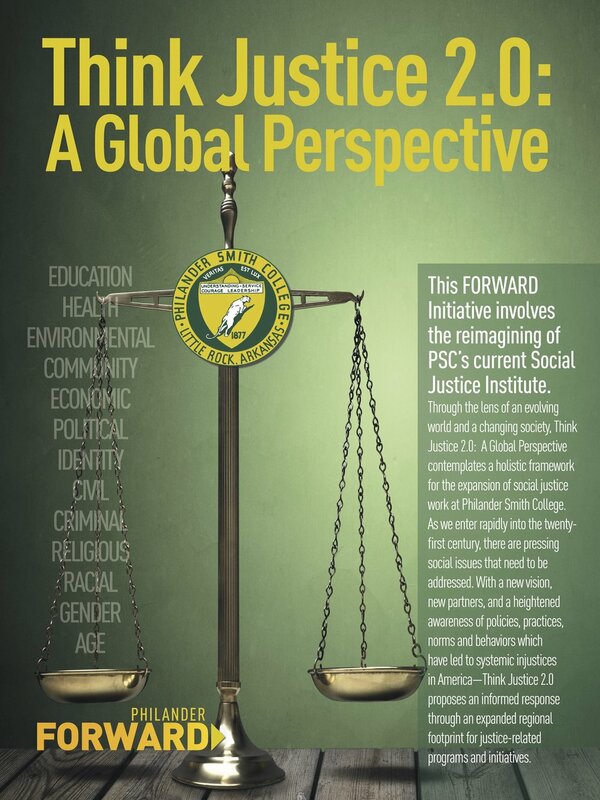 Through the lens of an evolving world and a changing society, Think Justice2.0: A Global Perspective contemplates a holistic framework for the expansion of social justice work at Philander Smith College. As we enter rapidly into the twenty- first century, there are pressing social issues that need to be addressed. With a new vision, new partners, and a heightened awareness of policies, practices, norms and behaviors which have led to systemic injustices in America—Think Justice 2.0 proposes an informed response through an expanded regional footprint for justice-related programs and initiatives.